Thai garlic picked in a 16 oz jar, there are approximately 12-15 whole garlic per jar. 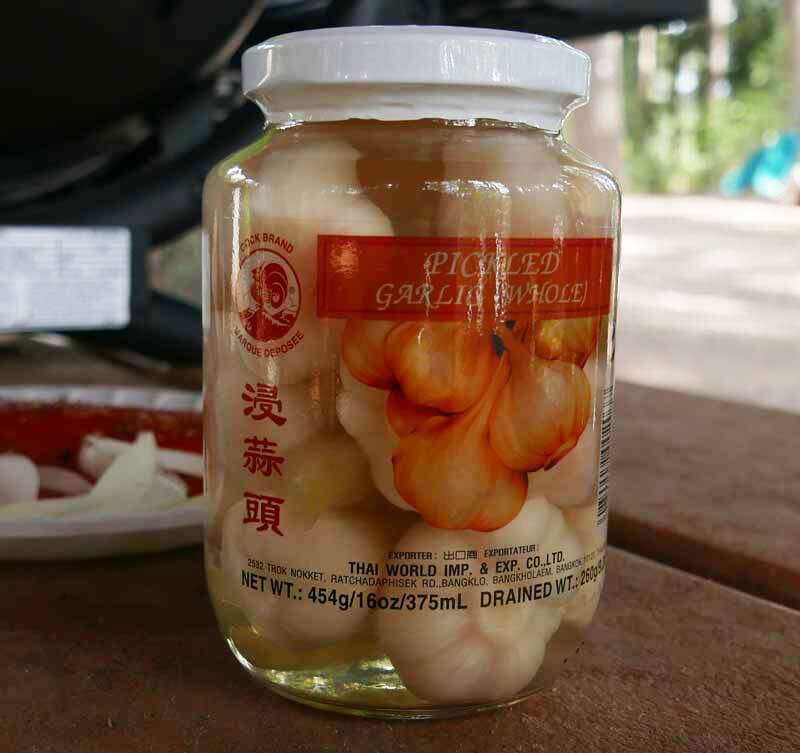 Pickled garlic is used in various Thai recipes (see below), and you can use for any type of non-Thai recipe as well. The garlic is very clean, and tastes great. Excellent qualty. Packed in a glass jar. Ingredients: garlic 57%, water 16%, sugar 15%, vinegar, salt, sodium benzoate as preservative, sodium metabisulphite. Product of Thailand. Bring this unique, fragrant, Thai-style sausage to your next barbeque party, and rest assured nobody will have the same thing. We used high quality ground pork from a local butcher who used pork shoulder, and we recommend that but it's not necessary. This is a rich, tasty meal in itself because of the mix of meat and rice, and one you can find all over Thailand especially in the Northeast (Isaan) area. See pictures of a Bangkok street vendor offering the same sausage. We also have a recipe for Chiang Mai (northern) style Thai sausage, Sai Oua. The authentic sweet/sour sauce offers wonderful, exotic flavor. It can be served without the pork and shrimp for vegetarians. In Thailand this is prepared in a wok but we used a pot to fry the noodles which worked well, and a skillet to fry the other ingredients. See pictures below, also read about Mee Krob as part of our sidewalk guide of good eats in Bangkok.